Working with red paint can be problematic for some folks. There are lots of different ways to go about getting a nice "red" on your models, all you need to do is find the right technique for you. 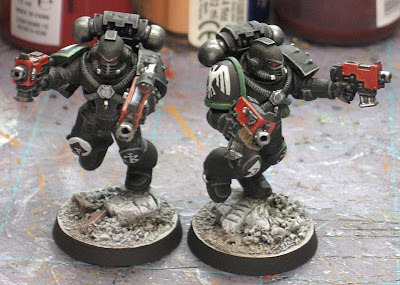 When I posted pics of the Raven Guard squad I was working on recently, I was asked how I painted the red on their gun casings. I went to great pains to make sure my reds on those models did not get bright enough to evoke the dreaded "Christmas Tree effect." 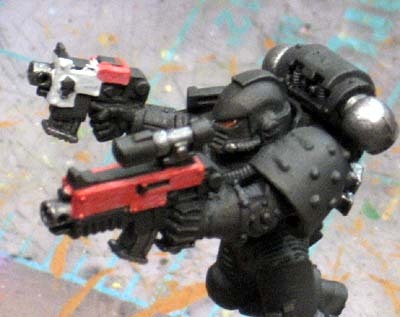 The technique I used was one I developed while painting Space Hulk terminators and even further back with my Saim Hann force I did long ago. Here's the step by step for the Saim Hann technique. Here's the step by step for the Space Hulk terminators. In this case, I started again with a light grey basecoat over the areas that were to be red. I kept the area small as well. I used the red as more of an accent color. With the area based light grey (to keep the red from being too dark over the black), I added my layers of red. It only takes two coats with the red I use when working over the light grey. It's a craft paint called Moroccan Red from Delta Ceramcoat. It's not that bright to start with so it allows me to push the red into the muted category or make it brighter depending on what color I use to highlight it with. Two washes of the GW Baal Red turn the base red into a rich red color. One pass with Devlan Mud in the recessed areas adds some contrast and darkens the recessed areas. I highlight just along the edges with a Terra Cotta color. It's a muted orange brown color that adds a nice highlight and keeps the overall look muted in this case. I've recently started working with the GW Foundation Mechrite Red. It's almost an exact match to the red I'm using now and it has slightly better coverage. Like all other Foundation colors it seems, it's thick and can stand to be thinned a bit to get the best results. If I'm just painting something like purity seals though, this is great since I can put it on over any base color, it only takes one pass and I can keep on working. 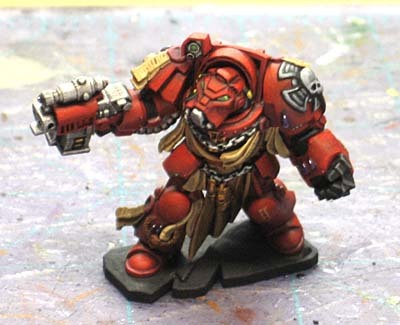 So if I were to try and explain to someone how to paint red, I might tell them to try and number of different techniques until they find one that they can do and gives them the results they're looking for. It all comes down to having a "formula." It's taken me some time to figure out how I "paint red," but now that I have it down, I can try some new things and really fine tune my results. Great post, I like the step by step for the terminators and I'll have to give the terminators a try. I recently started to use a reaper master series triad pack for some ultramarines with good results. I use Mechrite red with Blood red over it and then a red wash, and a blood red and orange mix as a highlight. The GW foundations have been good for me with problem colors I also use the Yanden Darksun under yellow, and the Astronomican Grey under white. I think it all comes down to how you want the red to look in the end. I pretty much always use Mechrite Red or a similar equivalent when painting red first. For Darker red colors, or for bright reds that I don't want to take to an Orange color (Like how BAs are typically painted) I start with a wash of Ogryn flesh. For A Brick Red Color I start with a wash of Gryphone Sepia. For Orangey Reds I would use Baal Red. For Purplish/Wine Reds I'd use a thinned Purple wash.
Lots of Techniques. All you can do is try them out and find what you like. Particularly when painting red cloth I always shade my basecoats (Mechrite Red) with Asurmen Blue before highlighting with Blood Red followed by the old Blood Angel Orange. The blue darkens the recesses without looking as unnatural as black or brown can. Excellent post! I've been experimenting with a variety of reds with some recent work on Khorne daemons and marines. I found that repeated dark washes are part of the key of getting it looking gritty and realistic -- I've been shying away from the bright blood red colours in favour of a more muted and menacing dark red (dried blood?!) tone. Thanks for the plug as well. The recent FtW painting articles are fantastic -- I'm really enjoying them. airbrush, thats the best way i find of doin red. starting over a black base, using a thinned out (but not overly) red, slowly build up the red. if you keep it moving, and pick a point to focus your light from, it makes shading it so much easier, then you just finish off with a wash of a darker colour to make the darker areas more definative, then a minor highlight on raised areas with your red again. of course, for just bolters n boltguns, that does mean either alot of masking so you dont get red all over your painted marine, or you do that first prior to the bulk of your marine is painted. Awesome post Ron! I'm always interested in how other hobbyists do Red. I'm doing it a quite weird way, if I may say so. Not sure how I ever found out about it. But I normally highlight from a basecoat of black and Red Gore. 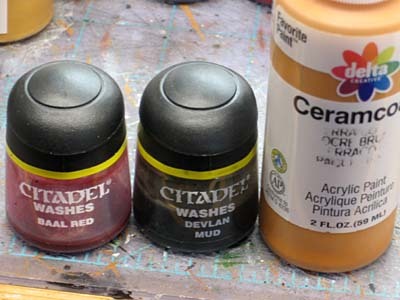 After that I blend till Red Gore alone (my Red Gore is quite thin, it doesn't cover that good, thus very good for this). After I'm finished I make a pinkish mix, paint the next few higlights with more white added the higher I get. After I'm 'satisfied' (the armor/cloak will really, really look stupid now with the really pink highlights) I wash/glaze those parts with a little watered down Red Gore. Normally I need a glaze or 2 until the pink color is gone. Now I really have very warm red color highlights, one I cannot get with Blood Red. I've tried several techniques but I keep falling back to this one. I just don't like the way the Blood Red comes out for instance. Other ones also come out too orange-ish. I will actually try the brown/orange mix, perhaps that's the tone I'm looking for for a long time! Paint My Figs: try it out, you may not like it in the end, but you may come up with something new that does work for you. SC John; I use the Darksun Yellow as well for starting out my yellow colors. HuronBH: Well said. I like your idea to use a blue wash. I might try that to really push those recessed areas back. Dave@Roll With It: And you use the blue wash as well... interesting. jabberjabber: Glad you like it. Thanks for sending me your link. That's how it's supposed to work. Mephistopheles: I have an airbrush, I just need to learn how to use the silly thing. Dannis: Glad you liked it. It sounds like your technique is involved, but if it works for you... by all means, stick with it. In the end, the goal is to get the results you want. Sometimes it will take a bit of work, but I've found I enjoy those models more. There was an 'Eavy Metal article in White Dwarf sometime last year that featured tips on painting cloaks (it might have been one of the High Elf models). They detailed using blue washes and also suggested using a green wash as another alternative. I've never actually tried washing reds with greens but it sounds interesting.